Number one New York Times bestselling author Tad Hills returns with an all-new Level 1 Step into Reading story about Rocket’s 100th day of school. 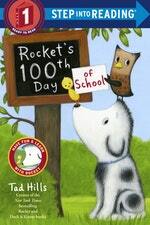 Rocket, the beloved dog from the New York Times bestselling picture books How Rocket Learned to Read and Rocket Writes a Story, is busy collecting 100 things to take to school on his 100th day, and he has the perfect place to keep them safe. That is, until Bella, a squirrel who loves acrorns, gets involved. Step 1 Readers feature big type and easy words. Rhymes and rhythmic text paired with picture clues help children decode the story. For children who know the alphabet and are eager to begin reading. Love Rocket's 100th Day Of School Step Into Reading Lvl 1? Subscribe to Read More to find out about similar books.